Made from recyclable, BPA-free plastic, Cuppow fits onto your favourite canning jar, so you can enjoy spill-free sipping while on the move, or at your desk! It's a simple green alternative that does away with disposable cups and over-designed travel mugs. 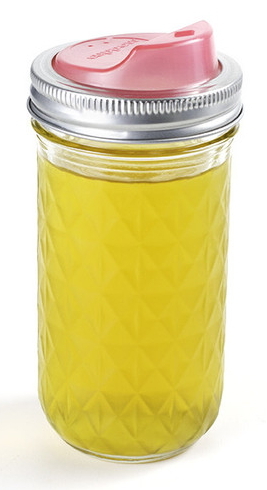 This lid fits a regular mouth jar (diameter of 2.5"/6.35 cm) and features a diamond-shaped hole designed to fit a straw. Great stocking stuffer for the environmentally conscious! This size of cuppow fits on a jam-sized mason jar. Perfect for myself or even my preschooler to drink from. Love that the opening can also fit a straw! This drinking lid is AMAZING! It makes drinking out of mason jars so much easier and looks super cute too! I love this colour. 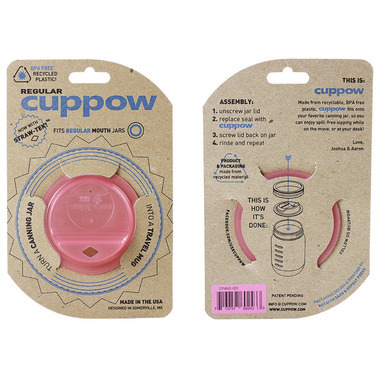 I have found that if you flip the cuppow upside down you can put the canning lid and ring around and then it will be spill proof until you want to use it as a sippy cup. I love how this company uses recycled materials and minimal packaging. absolutely love these! makes my favorite mason jar into a travel mug, love! also, really great for my little ones to use as a sipoy cup with a smaller size jar.